This two bedroom two bath oceanfront condo is located on the third floor of the Rincon Ocean Club II condominium complex located along the popular Playa Corcega in Rincon. The balcony has a spectacular view of the ocean and Corcega Beach as well as the complex pool (use included with rental). This home is perfect for relaxing and enjoying the wonderful sunsets Rincon is famous for. A 2 bedroom (Master bedroom w/King Size Bed, 2 Full size beds), 2 bath, condo apartment with fully equipped kitchen, Air conditioning, Cable TV w/VCR, all bed linens, secure off-street parking, a balcony with ocean views, large deck for barbecue or tanning, key access to beach, located in a quiet gated and secured community of the Rincon Ocean Club II condominium community of Rincon Puerto Rico. Price for accommodations: daily rate: $150.00, weekly rate of $975.00 Max of 6 persons. " 1 wk min. " 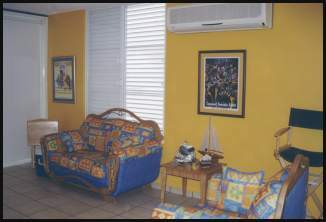 This Puerto Rico vacation rental apartment is located along the beautiful Corcega Beach south of Rincon. 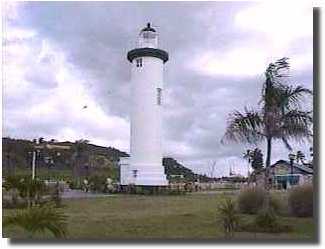 This is a golden sandy beach suitable for swimming, whale watching (in the winter), and other water activities. Or just sit back and relax in you own covered balcony, and enjoy the surf and the beautiful sunsets each day. This apartment offers all the amenities you expect in a relaxing vacation. It also includes a safe and fun kids play area for use by the little ones you may take along for your vacation.